If your order weighs less than 13 ounces, save huge on shipping with USPS first class (with tracking number). This product weighs 7.4 oz. Nature’s Sunshine Dieter’s Cleanse helps cleanse the digestive tract so that the body is able to more efficiently dispose of waste, along with helping the absorbtion of nutrients. 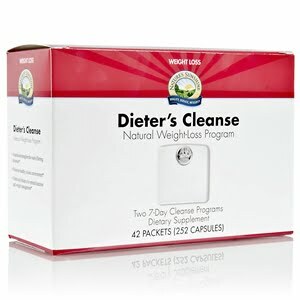 Dieter’s Cleanse is a safe, simple, and convenient cleansing program. Product elements provide dietary fiber, support the production of digestive enzymes and bile, nourish the liver and glandular system, promote detoxification and support the body’s weight management. Instructions: Take the contents of one (1) AM packet with breakfast, one (1) NOON packet with lunch, (1) PM packet with evening meal with 8 oz of Nature’s Spring water daily for seven days. 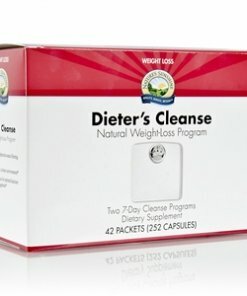 The second-week supply of Dieter’s Cleanse can be used during recommended rest periods of other NSP weight-loss programs. This product may also be used by any adult desiring a two-week cleanse. This product could produce a bowel movement during the night or in the morning. Other Ingredients: Psyllium hulls (Plantago ovata), Algin (from brown seaweed), Cascara Sagrada bark (Rhamnus purshiana), Bentonite clay, Apple pectin, Marshmallow root (Althaea officinalis), Parthenium root (Parthenium integrifolium), Charcoal, Ginger rhizome (Zingiber officinale), Sodium copper chlorophyllin, gelatin, and water. Other Ingredients: Licorice root (Glycyrrhiza glabra), Alfalfa aerial parts (Medicago sativa), Asparagus stem (Asparagus officinalis), Black Walnut hulls (Juglans nigra), Kelp leaves and stem (Ascophyllum nodosum and Laminaria digitata), Parsley leaves (Petroselinum crispum), Parthenium root (Parthenium integrifolium), Thyme herb (Thymus vulgaris), Asparagus stem (Asparagus officinalis), Dandelion root (Taraxacum officinale), Dong Quai root (Angelica polymorpha), Lemon bioflavonoids, Schizandra fruit (Schisandra chinensis), Eleuthero root (Eleutherococcus senticosus), Marshmallow root (Althaea officinalis), Uva Ursi leaf (Arctostaphylos uva ursi), gelatin, and water.